major change in his life. Murphy's full name is "Murphy's Law" and that name was given as a forecast of all that was expected of him. Even though he was born three weeks overdue, he was underweight and scrawny. By one measure or another he was not considered good looking -- mostly in comparison with his trophy-winning brother. It was hardly an auspicious start. At the ranch Murphy became low horse on the totem pole. So the young gelding spent his days wandering the ranch eating grass and getting little exercise, so he started to gain a lot of weight. The Portland Police Department bought Murphy from a Craigslist ad and his life was totally turned around. First of all, he was put on a strict diet and aerobic exercise with an electric walker. This sort of walker is something like a horse treadmill that keeps the horse walking in a circle with a prod. Before losing his excess weight, the unit did not own a saddle large enough to fit him. After months of hard work, police training, and 200 pounds down from his original 1900 pounds. 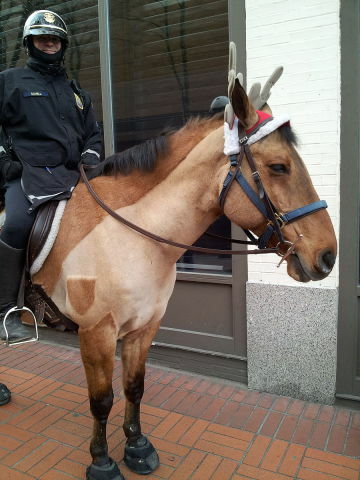 He began patrolling the city's posh Pearl District as one of eight horses that patrol downtown. Last week Murphy helped make his first collar while carrying Officer Cassandra Wells. 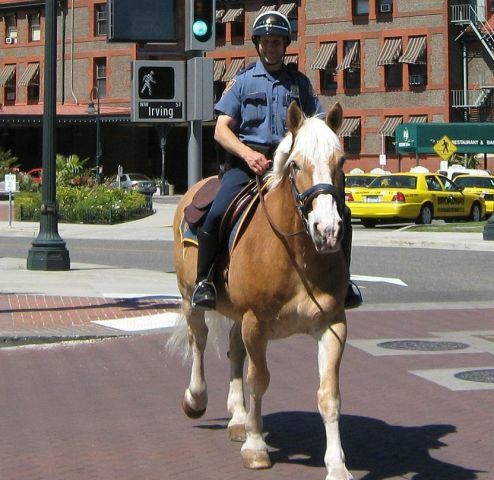 He galloped six blocks to trap a break-in suspect against a building in the Old Town District until back-up officers arrived to cuff the man. Wells claims that Murphy is the best partner she could have. He keeps learning and she couldn't ask for better. Murphy may not be another Seabiscuit, but his story is the stuff of which both legends and movies are made. This Lovebird Really Loves Her Car -- The Animal Video of the Day!! !